I am a travel planner. I specialize in Italy because I live in Italy, I have traveled extensively in Italy and I know people all over Italy. What I do not know, they do. We help each other. For my trip to France, I used the techniques that I have used for my clients in Italy. However, things did not go as planned. I forgot to check the trains for strikes. My overnight train trip from Milan to Paris was a day of a strike. Unfortunately, I spent 12 hours overnight on a bus to Paris due to the strike, without sleep. I ended up falling asleep in my hotel room and missed my first day in Paris. And I panicked! I am a travel planner. I realized that the other 2 days I planned to travel by train were both STRIKE DAYS. I was going to need to revamp my entire plan. After talking with my daughter who reminded me that nobody died and it is just money, I changed all my plans. And I booked a day trip to Mont San Michele. A place of magic and mystery filled with the energy of worship back to Celtic times. I made it to the top, which was a real challenge. The views were incredible. Mont San Michele is situated on an island where the tides are extreme. While we were on the Island the tide was out. You could see the bottom of the ocean from above. Inside the monastery, built with layers of medieval construction and all the corbelled arches. I was in my element and hated to leave. But Paris awaited and my Godson Jim, his wife Kory and son, J.T. would be meeting me at the new hotel the next day. These people are very special to me and the main reason I was going to France. We visited the Eiffel Tower together. Where I used my Nikon to take many photos. I could see nearly all of Paris through my lens. I love those flying buttresses on the outside of this cathedral. They support the arches inside. We shared all this and more. For the first time, I took a hop on hop off bus and had a wonderful view of the city. We had so much fun doing that and walking until I thought my feet would fall off. We visited the Louvre twice. My favorite artist is Da Vinci. I saw the Mona Lisa for the first time. I loved her hands. And His John the Baptist genius work of art. I was in heaven, surrounded by art and the love of some of my family. Jim, Kory and J.T. were leaving after only two nights. I realized how much I missed being with some of my family members. I missed hugs. And, although I love solo traveling, exploration and new experiences can be enhanced so much by sharing them with those you love. After we said our farewells, I was off to see Notre Dame of Paris. We had all been there the night before but we had not gone inside. With my Nikon in hand I was off. I am fascinated by the creativity of the medieval architects and craftsmen who created Flying Buttresses to support the interior arches. The weight of the stone arches pushes outward while the buttresses push it back inward preventing collapse. And they are beautiful. The formulae for the stained glass windows was kept secret by the guild who created these brilliant works of glass art. And it was lost forever. We cannot duplicate the colors they achieved even today. I could post a hundred more photos of Notre Dame. Such as the saints walking on the rooftop. Complete with gargoyles as seen above. But it was time to head to another chapel. Saintes Chapelle, a royal Chapel. I was in heaven once again. Who cares if it is raining and my plans for visiting the Loire Valley and their castles wasn’t going to happen because of the strike? 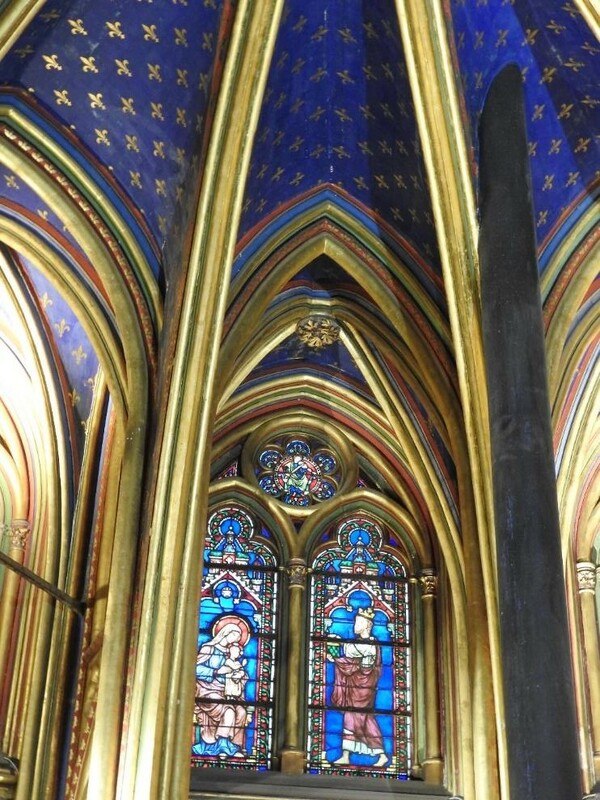 I was happy to be in Paris surrounded by splendid Medieval art and architecture. The next day was a NON-STRIKE day. 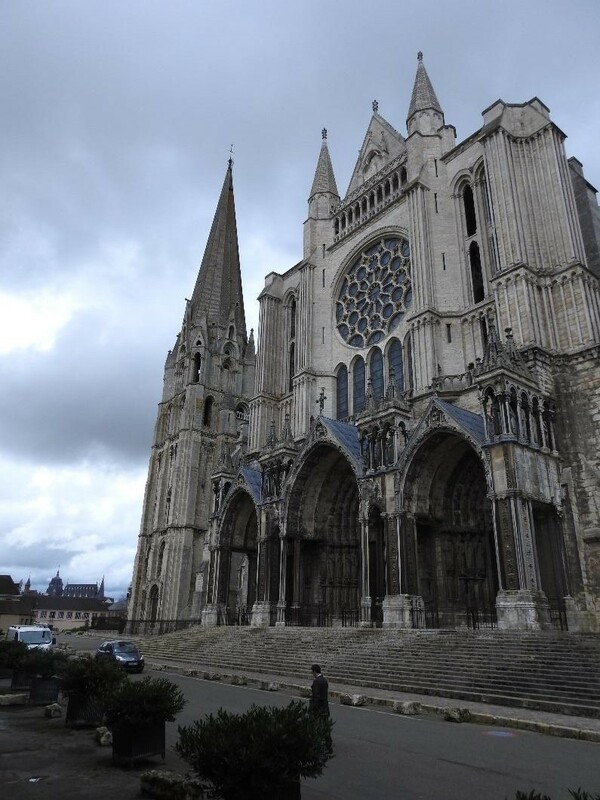 And I headed for Chartre’s Cathedral. I had planned to stay overnight. Now it would be a day trip to one of the most renowned Medieval architectural wonders in Europe. The rain would not stop me. Nikon and I were off. Walking up to the façade of the cathedral, I was quite impressed by the exterior detail. I was fascinated and walked all around it. Here’s a detail of the flying buttresses. I must have taken over a hundred photos of the interior with my Nikon and my phone. Somehow most were deleted. Inside the church they have been cleaning and restoring it for years. On the floor is a Labyrinth that I had hoped to walk. Again, I did not do my research. You can only walk that labyrinth on Fridays. There is one outside, but it was not the experience I had wanted. And the steps were damp and slippery. I wish I could show you more. You will have to visit Chartre yourself. I got lost walking around town and trying to find my way back to the train station. It is a lovely town. Next time I will go on a Friday and stay overnight, Train strikes willing. The following day, Paris and I parted ways. I took a grueling, 14-hour train ride home to Chiavari. I almost missed the last train transfer and was so exhausted I never did find my reserved seat. This was another mistake. I should have flown both ways. I thought it would be an adventure taking the train both ways. Well, it was an adventure—just not the one I had expected. Thanks for experiencing my adventure in France with me. I have learned a great deal about traveling in another country where I do not speak the language and do not have the expertise as I do in Italy. It is easier also to understand the frustration other travelers can feel in a country where you do not speak the language or know all the ins and outs of the places you visit. I am humbled by my mistakes, enriched by the love of family and the sheer beauty of Paris and the Medieval art and architecture. But next time, I will talk with a travel arranger for France. I will hire an expert to help me achieve an even better vacation than one I could do myself. If you want the best vacation in Italy you can experience, contact me at Marilyn@takemehomeitaly.com. I can help you plan something special in my second country of Italy. And I will check to see if there are any strikes while you are visiting. Next week, watch for Part 2 and the experiences with friends and foibles in Italy!